I've rebooted my phone and restarted my Anker speaker. I keep getting the message below. Any ideas how to trouble shoot this? I'm using a Motorola Droid Z Force. 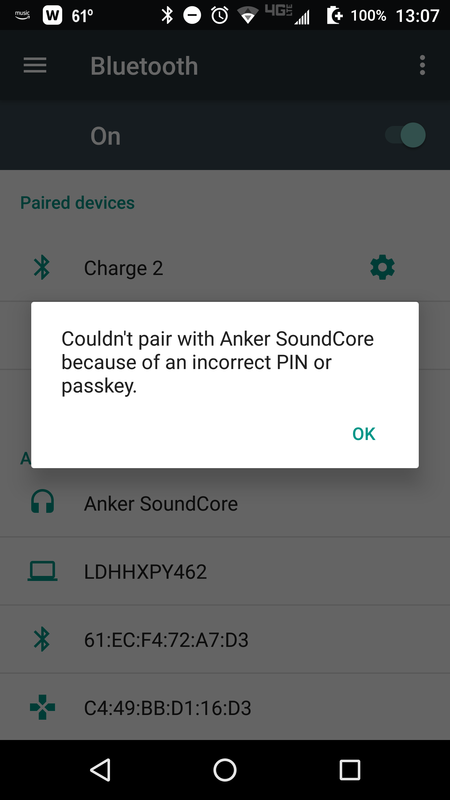 Couldn't Pair with Anker SoundCore because of an incorrect PIN or passkey. If its still not working, you can first reset the Bluetooth by holding the Bluetooth button continuously for more than 2 seconds and get your device at least three feet away from your phone. Then pair again. If that persist then I suggest you reset the soundcore by holding the power button until the light changes from white to orange, then pair. A similar thing happened to mine but after these steps it worked. Hi there, I am also having this issue, tried the suggestions listed here, but am still not able to pair with my Moto X or with Alexa. I just got the Soundcore Flare – any advice is welcome! Nope, does not work with 1234 or 0000. I have a really old laptop, I guess Anker does not work with old stuff... awesome! I had the same problem initially. However, it paired seamlessly using the app that I added to my phone. Being asked for a PIN to start pairing; factory set PIN? Most BT defaults are either 0000 or 1234 , you could try them for starters. If you still having issues afterwards you could drop support@anker.com a email with the issue for further assistance. SoundCore headphone icon show up in the Bluetooth page on my phone (Moto X4). I couldn't connect through the Bluetooth icon, but the headphone one paired perfectly. Maybe the solution is, to switch the Bluetooth Mode from True Stereo (e.g. designed to use two Soundcore Flair loudspeakers) back to normal Pairing Mode. Tick 3 times fast to the bluetooh key on you soundcore flare, then scan again Bluetooth and you see a other Bluetooth soundcore device flashing in your Smartphone Bluetooth Settings..
connect with this and all is fine. just found on another reply - press and hold the + and- buttons at the same time until you get an audible sound and the blue light flashes. Worked straight away, think it forced the headphones to forget old phone.